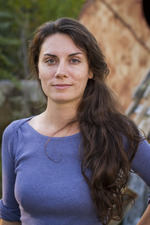 Melody Eötvös (1984) is an Australian composer based in Bloomington, Indiana. Her work draws on both multi-media and traditional instrumental contexts, as well substantial extra-musical references to a broad range of philosophical topics and late 19th-century literature. She has studied with a variety of composers across the globe, including Gerardo Dirié (Australia), Simon Bainbridge (UK), and, most recently, Claude Baker and David Dzubay (USA). She has also studied electronic music with Jeffrey Hass, John Gibson, and Alicyn Warren. Melody has been the recipient of various awards, including the 3MBS National Composers Award (Australia 2009), an APRA PDA (Australia 2009), and the Soundstream National Composer Award (2012). She has had her music performed by ensembles/orchestras such as the London Sinfonietta, BBC Singers, Tasmanian Symphony Orchestra, and the Australian String Quartet, and has participated in several electronic music festivals including SEAMUS 2011 (US), ACMC 2012 (Australia), and ICMC 2011 (New Zealand). In 2015 Eötvös received a Virginia B. Toulmin Foundation Orchestral Commission (administered by the League of American Orchestras and the EarShot Foundation, with world premiere at Carnegie Hall on 23 October 23 2015). She was also guest composer for the Bendigo International Festival of Exploratory Music 2015, a commissioned composer for the Synergy 40x40 project (Sydney, Australia), and a composer fellow at the Aspen Music Festival & School 2015. Recent projects include commissions from the Tasmanian Symphony Orchestra (The Saqqara Bird, 2016; Ruler of the Hive, 2018), Synergy & Vox (A Strange Manuscript Found in a Copper Cylinder), Guy Yehuda of Michigan State University (The Three Alcids), Australian Youth Orchestra (2017), Inventi ensemble (2017) and she was a composer resident at the Aaron Copland House in May 2016. Current commissions include a Guitar and Cello work for Duo Atlas (France), String Quartet no. 3 (Walden/MIVOS), and a commission for the Philadelphia Orchestra (2019). In 2019 Melody will also be taking up a new academic position at the Melbourne Conservatorium of Music as Lecturer in Composition and Aural Skills. Melody holds a Doctor of Music (2014) from Indiana University Jacobs School of Music USA, and a Master of Music (2008) from the Royal Academy of Music, London. At present she is an adjunct lecturer of music at the Jacobs School of Music Indiana University. October in the chair (sextets: flute, oboe, harp, violin, viola, cello) (2017) Commissioned by and written for Inventi Ensemble. The Saqqara Bird : for symphony orchestra (2016) Commissioned by Tasmanian Symphony Orchestra. Piano Sonata No. 1 : The Demoiselle D'Ys (2016) Commissioned by Bernadette Harvey. House of the beehives : for flute, oboe & fixed-media (2015) Commissioned by Julian Burnside. Counterpoint : for solo percussion and electronics (2014) Commissioned by Musica Viva in collaboration with Claire Edwardes and the Red Room.